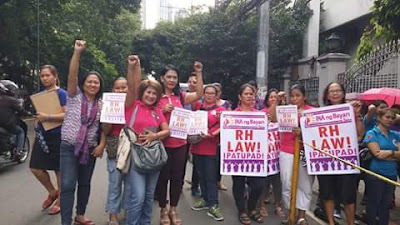 Members of Partido Manggagawa (PM) expressed this frustration as they joined reproductive health advocates in asking the Supreme Court to lift its TRO on the implementation of RA 10354 or the Responsible Parenthood and Reproductive Health Act of 2012. According to PM Secretary General Judy Ann Miranda, the TRO issued by the high tribunal did uphold the constitutionality of the RH law but purchase and distribution of RH supplies and were withheld prior to the formulation of new rules in granting certification to certain contraceptives. “We respect the granting of due process to the petitioners but it can also be argued that the RH Law can be implemented beyond the specific supplies being objected to since there were already approved safe contraceptives available in the market prior to the enactment of the RH Law. In other words, access to safe contraceptives can readily be made available in all RH facilities nationwide,” said Miranda. Miranda said a big part of RH Law can be implemented while contested supplies are being subjected to certification and recertification by concerned agencies. She added that the previous and present administration were supportive of RH Law and therefore implementation of this measure, whether in part or in whole, should not be a problem for the executive. “We therefore pray to our justices that the RH Law will be given its day as soon as possible for the interest of our women, especially the for women workers,” concluded Miranda.